Heat a pan with 1tbs of ghee and roast the rava in a medium flame till it turns pink and a nice aroma comes.Meanwhile boil the hot water and add the hot water to the roasted rawa,cook it till it becomes thick. Now add the sugar and condensed milk and mix it well till the sugar melts and incorporates well.Add the remaining ghee and mix it well. Add the mango pulp and mix it well till everything gets blend. Now add the fried cashews,almonds and finally cardamom powder and mix it well. Delicious mango kesari is ready. If fresh mangoes are used increase the quantity of sugar to 11/2 cups. The rawa needs to be fried in the medium flame,otherwise kesari will be sticky. 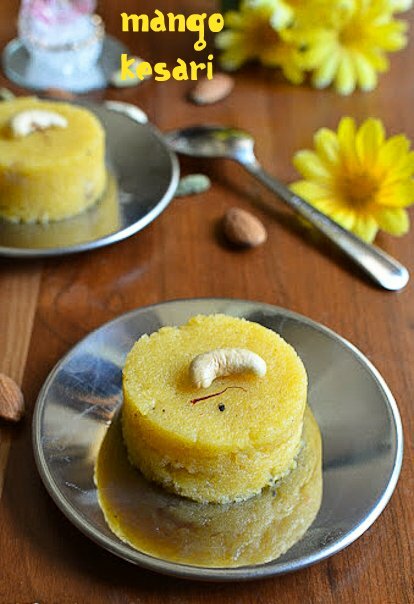 Adding the condensed milk gives a rich taste to the kesari. Saffron can be added for extra flavor. Very yummy kesari..loved the addition of mango pulp. Belated birthday wishes to your son. 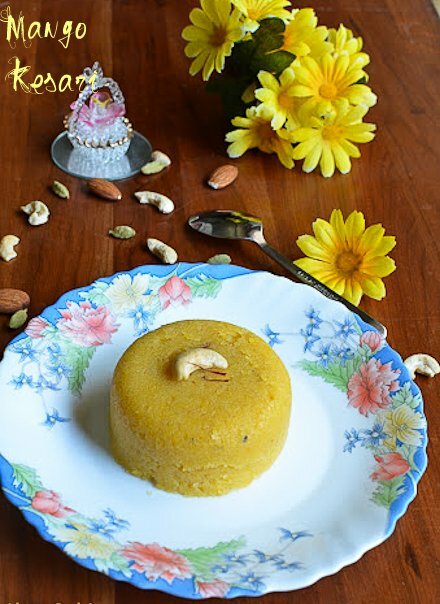 Belated birthday wishes to your kid Nalini, irresistible kesari,even my lil one love this. looks very yummy.. loved ur decoration...very tempting!!! Kesari twisted with mango pulp, so irresistible dish. Surely try it soon. Looks delicious...belated birthday wishes to your kid.. 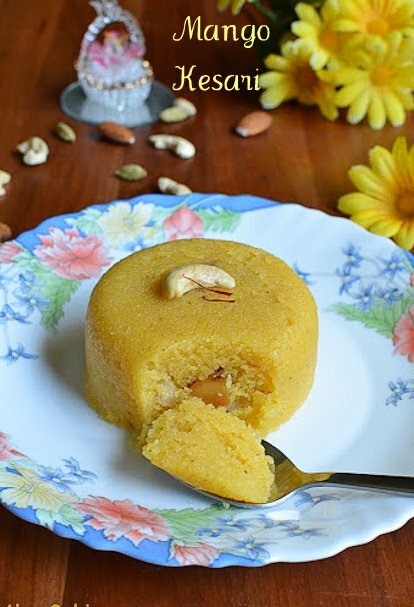 Wow..Superb kesari...feel like having some. Belated Birthday wishes to your son...keerai looks delicious! Thanks for sharing the ingredients. Special days in human life is birthday, sharing online Birthday Wishes and Messages make us pleasant.